As is tradition at Pixar, the studio will be debuting a new short film in front of Toy Story 3 this summer from one of their own artists. This year's short is called Day & Night and is the directorial debut of Teddy Newton, a storyboard artist on The Iron Giant and character designer for The Incredibles and Presto, too. ComingSoon has revealed our very first look at the short by way of this interesting advertising banner (seen below). This isn't official confirmed, but both SlashFilm and I think that this may actually be a 2D animated film about these two characters, and it looks quite wonderful, as always. Check out the new first look below! Here's the official Day & Night plot synopsis: "When Day, a sunny fellow, encounters Night, a stranger of distinctly darker moods, sparks fly! Day and Night are frightened and suspicious of each other at first, and quickly get off on the wrong foot. But as they discover each other's unique qualities -- and come to realize that each of them offers a different window onto the same world -- the friendship helps both to gain a new perspective." 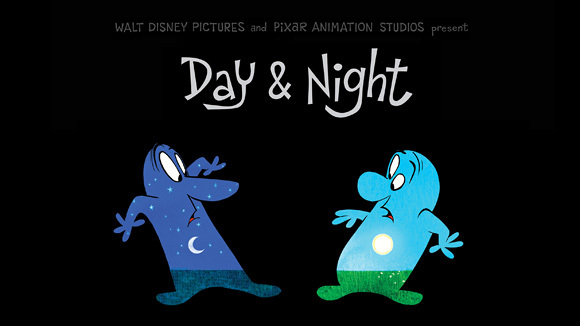 I'm curious if Pixar titled this Night & Day originally and had to change it to Day & Night once Fox retitled their summer Tom Cruise action movie to Knight & Day. Don't get confused - one of them has a "k", the other doesn't. I'm already looking forward to seeing this in front of Toy Story 3 this summer! You? Oh man I love these short films, especially The Old Men Playing chess...cannot remember the name, and the one before Wall=E. I hope this one is as good. It proves one thing Day Cannot exist without night. It has that Early Hanna Barbera look about it. I'm holding out on seeing this until in the theatre, I dont want to know anything going in to Toy Story 3 and the shorts get you so jazzed up that the feature is just that more engaging. But...I'd bank that this is CG, keeping with Pixars passion, as they've been doing various forms of non-rendered and/or glossed over CGI animation appearing like flat 2-D ever since Monsters Inc. Genius' reside at Pixar. Relentlessly impressive. Those characters have a Ward Kimball feel to them, very old school Disney. Should be awesome, as is always the case with Pixar. #4 - Hedgehog No, you're just a retard. I saw TOy Story 3 yesterday...the movie was great, and so was the short! Dont they have any good movies to make?